Click on the sail plan button for a gallery of expandable drawings showing what a new construction Q-boat will probably be like. Along with encouraging restoration of vintage Q-boats, we want to start a new class of modern Q-boats. These boats will race level under the New Universal Rule for competition amongst themselves, and will race against vintage boats under a velocity prediction program based handicap rule, somewhat similar to the concept used today by the J Class. While similar in type, and still narrow by today's standards, the best Q-boats have tended to be beamier than some other traditional boats their size. This fact enables the Q-boat to have a far nicer interior for fun sailing or short cruising. The new version of the Universal Rule mandates this greater beam. Boats built to this revised version of the rule will be, in hull form, basically similar to the existing boats: they will continue to be narrow, deep, long-ended boats, and will continue to have the displacement of the older boats. They will almost certainly have even more driving power due to the combination of displacement with lighter, modern wood construction, and modern carbon and mylar sails. 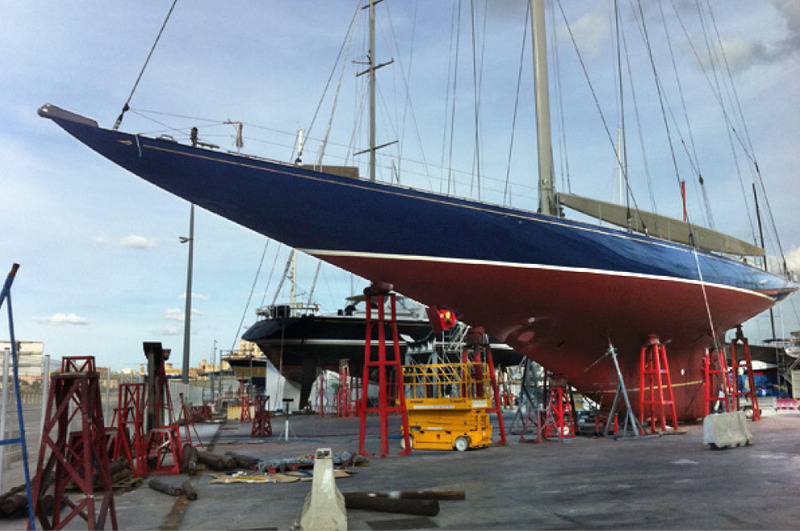 They will have a higher heeled speed from a longer quarter-beam maximum length, and will be more manageable downwind due to fuller stern sections. They'll have a taller rig for a more efficient sail plan. Finally, they will have more modern keels and rudders, which provide better maneuvering and downwind control. We have focused heavily on the need for adequate headroom in a world where everyone is getting taller. While this is more of a construction issue than a design issue (see “Construction” for more on this subject), it does impact the height, length and shape of the deckhouse, which we have expanded over previous generations of boats in order to provide nearly 2 metres of headroom at the center of the main cabin. Masts for new construction boats will be carbon fiber or aluminum, with a minimum weight to keep the competition within reasonable limits. 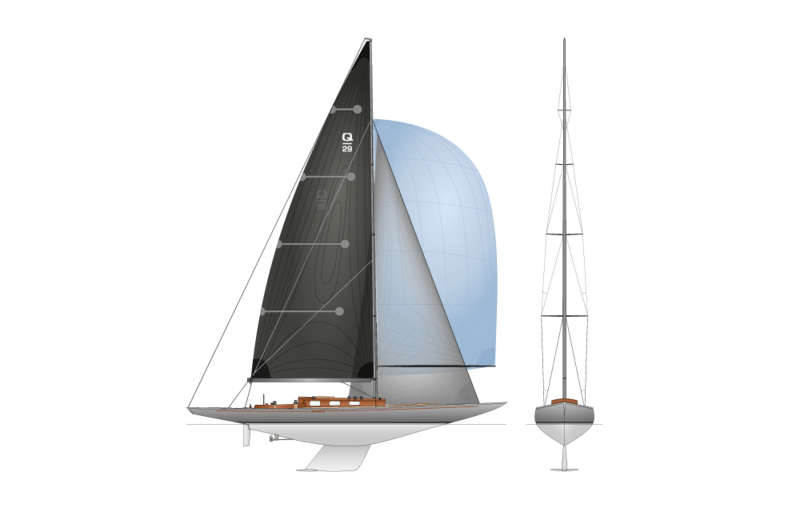 Booms and spinnaker poles can be wood, aluminum, or carbon fiber. We would anticipate that restored boats might choose wooden spars, although they do have a free chouice of materials. Performance changes will be accounted for the Class Handicap System (VPP). Both Aluminum or Carbon Fiber spars are proposed. Both have a range of benefits and the choice is open. There will be a minimum weight for the spar to ensure reasonable compatibility with other yachts in Class. Both these beautiful yachts were designed under the 1930 Universal Rule: long waterline narrow beam, with long keel and big rudder for positive control. On the left the 130ft J Class yacht “Endeavour”. On the right the 49 ft Q Class yacht “Cotton Blossom II”.